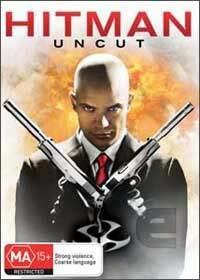 Hitman, based on the popular series from Eidos Interactive is the latest attempt to bring a gaming franchise to the movie world. For three years, a top Interpol agent (Dougray Scott) has been chasing an elusive, unknown assassin. When a Russian politician is murdered, the cop clearly suspects that Number 47 (Timothy Olyphant) has struck again. The paid killer is informed that a prostitute named Nika (Olga Kurylenko) witnessed the crime and he is ordered to take her out. Of course, it's all a setup. Belicoff (Ulrich Thomsen), the supposedly dead candidate shows up for a speech and the Russian Intelligence community is out rattling 47's cage. Our anti-hero saves Nika from a bullet, travels to Istanbul to interrogate Belicoff's drug running brother Udre (Henry Ian Cusik) and returns to the scene of the initial shooting to discover why he was framed. Turns out, it has more to do with one man's paranoia and ambitions than a simple contract hit and 47 is destined to play a part in it all. With a confusing premise and an equally unfathomable conclusion, Hitman really misses the mark. It's more sullen than suspenseful, using blood and firepower as a replacement for atmosphere and pacing. Even fans of the game will be a little disappointment, however if you are interested in a mindless slug fest than Hitman is the movie for you. Decent video quality and sound, the Gag Reel is probably the best special feature on the disc.